Fits and locks in most KA-BAR knives with 7" blades. Glass-Filled Sheath. Does not fit item 1271, 1273 or 1245. Got this sheath to go with item 1211. They work perfectly together. Found it funny how the sheath comes with instruction on how to use it properly. It's perfect for leg mounting and knives can be sheathed for either left or right handed draw. There's even a slot on the back near where the tip of a knife would be for drainage, just in case you get water in it. 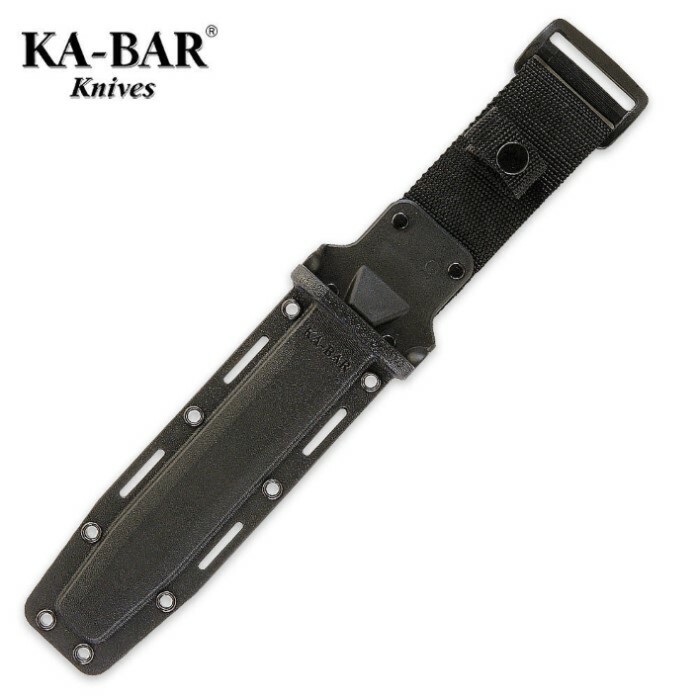 fits my USMC ka-bar knife perfectly and allows for either left or right hand grip. the lock does keep the knife in tight enough that without the button clip the blade is secure upside-down but with a bit of testing I found that anything like running or jumping wont work. will probably need to modify it a bit so that it pushes tighter on the handle to fix this minor issue.